Furnished apartment type 3 crossing, very bright, exposed EAST / WEST. Offer a beautiful view. - West Side you have a balcony that offers a beautiful view of Annecy and mountains "beautiful sunset"
The apartment was renovated and furnished nine in July 2011. You will have the advantages of the city to all amenities, and benefit from the country for its peace and beauty. Enjoy the balcony or you can enjoy a drink while watching the sun slept. Your children will enjoy the outside with table tennis, table football, badminton games, bowling ... .. The shaded terrace equipped with deckchairs, gives a warm quoted a rent. The garden does not have vis-à-vis realize this peaceful place where you can enjoy a barbecue, games at your disposal and the covered area for training. If you arrive before the scheduled time. You can leave your luggage in an enclosed area. This allows you to go on leisurely stroll without worrying about your luggage. Ideal for leisure or for temporary workers, or border. Capacity up to 8 people maximum and if more than 8 persons contact us. Pet allowed except dangerous classified categories. Possibility to rent nights, weekend, week. They vary depending on the time, duration, and number of people. The prices include all charges included: water, electricity, heating, sheets provided, towels, washcloths, linens, household products, wifi, private parking, as well as the cleaning fee. From 01 January 2017, the Tourist Tax is 0. 7 € per person per day. This tax is obligatory on all the community of communes of the Annecy basin. Only residents of the Annecy Basin and young people under the age of 18 are exempt from this tax. For baby: a bed, a chair, a bathtub ..
- For adults: 6 single beds plus a large bed. -A Separate kitchen is well equipped. 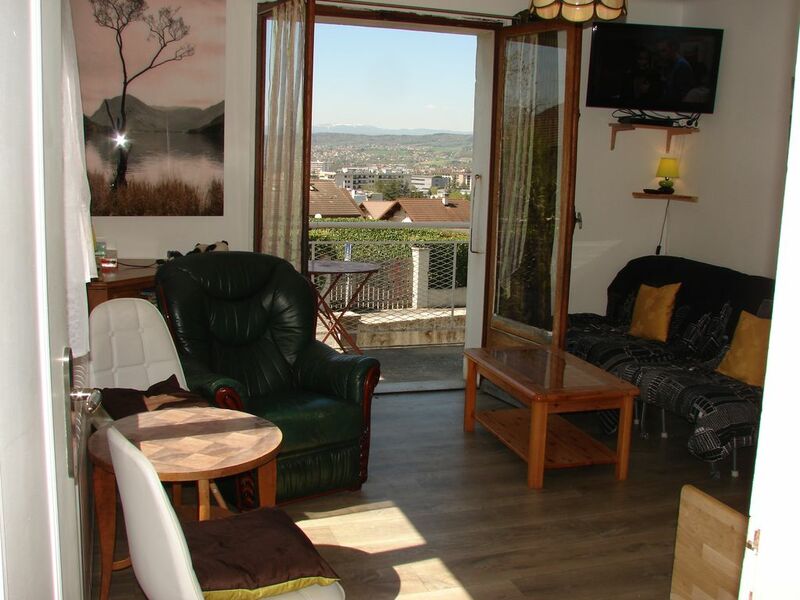 -A Very bright living room with a beautiful view on Annecy, surrounding mountains. Local bike storage ... -A. -A Large garden with BBQ, ping-pong, table football, bowling, deck chairs, a covered area. Nice bathroom with Italian fitted with a towel. Amenities Dishwasher, washing machine, dryer, towel dryer, refrigerator, freezer, oven, hot plates, coffee maker, electric kettle, microwave, dishes, utensils, iron, vacuum cleaner, TV, DVD player, Garden furniture, barbecue, deck, 2 private parking spaces Sheets and blankets. Great location to everything! Friendly owner. We loved our time in Annecy, although it was not long enough and it rained a lot while we were there so it stopped us from doing a lot of sightseeing. The location of the apartment was great, only 10 mins to downtown Annecy. The owner was nice and the apartment had some great amenities. As a family of 7 staying there, I LOVED that there was a washing machine and a dryer! A very rare find to have a dryer in apartments that we rent in Europe. The downside was that several windows were broken and taped and all needed replacing due to age, so it allowed moisture to cover them. We had to keep the heaters up high and shutters closed to keep the moisture down. The apartment was clean. I like that there was a vacuum for our use as well. Overall a nice stay but the house does need some work. Thank you for a lovely time in Annecy. This was our third vacation in Annecy. Our chief requirements for a vacation rental are private parking and a balcony. This apartment worked well with four adults and we used the (SW facing) balcony every morning and evening. The kitchen was well laid out and the free wifi was useful. The owner was friendly and welcoming; we were invited to use the secluded back garden - but we couldn't be lured away from the balcony! It was an easy drive from the apartment to the Carrefour supermarket on Ave. de Genève and to the A41 motorway. The historic centre of Annecy-le-Vieux, with shops and restaurants, was a short stroll along a quiet street. I was concerned that walking into Annecy itself, after a long day in the mountains, might be a problem for our friends, but there was a bus stop just around the corner and using the bus/noctibus to get to and fro was painless. Wir haben zwei schöne Wochen in der Wohnung verbracht. Durch die zwei Sitzmöglichkeiten im Freien auf dem Balkon und im Hof zum Garten mit den Hühnern und Kaninchen hin konnte man draußen sowohl Frühstücken als auch zu Abendessen. Die netten französischen Restaurants im Ortszentrum von Annecy le Vieux waren fußläufig zu erreichen. Lovely house and friendly owner. Super beautiful sunset view from the terrace. Bel espace dans une maison que le propriétaire; très sympathique; a su rendre conviviale et pleine de charme. Region magnifique qui offre un large panel d'activités ( sportives, ludiques..). Nous recommandons vivement cette location pour des vacances familiales ou autre! Pleasant apartment with new Kitchen and Bathroom. Close to a bus service to the town centre, but more convenient if you have a car. Clean, however towels a bit small and thin. Good to have owner on site for questions. Beautiful views over Annecy and the hills beyond from the apartment. This would be good with children. Highway entrance / exit 3km. Access Convenience: supermarket, market, pharmacy, bank, nearest restaurants 800 meters. Les tarifs sont valables pour un groupe de 2 vacanciers maximum : Pour chaque personne en plus, un forfait de blanchisserie de 7€ est demandé. Nota ce forfait est valable pour toute la durée du séjour. Vous le payé qu’ une seule fois a votre arrivée, ce forfait sert a couvrir les frais de blanchisseries : les couvertures, les couettes, les draps plat, les draps house , les Taies oreillers, les Alaises, les housses de couette, les serviettes de bains, les gants de toilettes, le linge maison. Et la mise a disposions des literies. La parking privé est gratuit Le wifi est compris dans le prix Sont également compris dans le prix : Le Jardin , les jeux extérieur, la table ping-pong , le babyfoot, le jeux de fléchettes, le barbecue, l’abris couvert, les transats.... Le prix varie en fonction du nombre de personnes présentes dans les locaux Merci de préciser le nombre exact de personnes.